The world's most demonic superhero returns to the big screen in Hellboy, director Neil Marshall's rebooted take on the Dark Horse Comics character starring David Harbour (Stranger Things) in the title role. The film promises an all-new look and feel for the character, taking its cues from a classic comic book saga which pits Hellboy against an evil sorceress (Milla Jovovich) with the fate of the world at stake. The trailers look great, the star is instantly lovable, and the film has all the makings of another comic book blockbuster. That doesn't mean you don't have questions, though. For instance, why is this film a reboot at all? Why is it R-rated? How much was Hellboy creator Mike Mignola involved in the production? Or, if you're new to this whole scene, perhaps you're just wondering who Hellboy is in the first place? Well, we're here to help. Read this before you see Hellboy. Hellboy was created in 1993 by writer and artist Mike Mignola, and appeared in various one-off stories and illustrations before his own first story arc, Seed of Destruction, arrived in March of 1994, published by Dark Horse Comics. Despite his bright red, horned humanoid appearance, Hellboy is technically only half demon, as the comics establish him to be the child of Azzael, a Duke of Hell, and a witch named Sarah Hughes. Born in Hell after his mother's body was taken there by his biological father, Hellboy was summoned to Earth in 1944 as the result of a Nazi occult ritual led by the sorcerer Grigori Rasputin, but actually first appeared at a site near the ritual in England, where American soldiers and Professor Trevor Bruttenholm were investigating the Nazi activity. It was Bruttenholm who christened him Hellboy, and the young creature was transported back to New Mexico to live under Bruttenholm's care. Over time, it became clear that the young Hellboy was, despite his appearance, an apparently good soul, and in a matter of years he was recruited to become the world's most effective paranormal investigator. 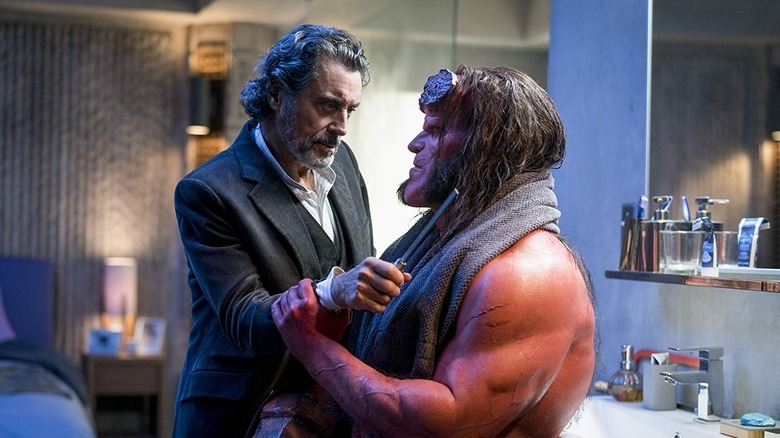 Working with Bruttenholm as his mentor and surrogate father, Hellboy travels the world battling various paranormal threats including everything from demons to vampires to reanimated corpses, saving humanity in the shadows even as certain dark conspirators hope to use him and his abilities for their own nefarious needs. As a half-demon, Hellboy possesses many physical qualities that make him superhuman, including extraordinary strength and durability that allow him to continue doing battle well after many of his human cohorts would have been knocked out of the fight. He's also able to see better than humans, has a natural understanding of various arcane languages, and perhaps most importantly, he's been shown to be basically fireproof, which makes sense for someone who's half Hellspawn. 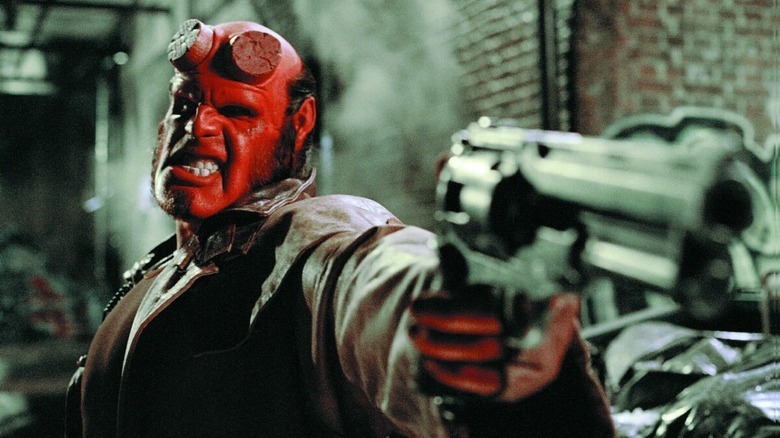 In more recent comic book stories, Hellboy has assumed greater control over his demonic form, to the point that he can manipulate his own size and even sprout wings and full horns when he wishes, though this is not generally an ability explored in film versions of the character (yet). Then there's the matter of his right hand, which is a massive cylinder of stone complete with large, blocky fingers. Known as the Right Hand of Doom, it was grafted onto his infant body by his father at birth. The hand originally belonged to an ancient spirit called Anum, who was the creator of the Ogdru Jahad, the legendary imprisoned creatures who will one day be released and bring out the end of the world. The Right Hand is said to be the key to releasing and controlling the Ogdru Jahad, as explored in the first Hellboy film in 2004. 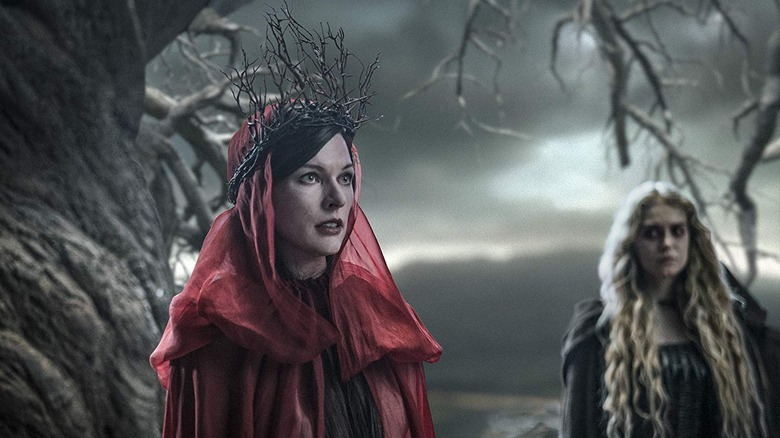 In the 2019 Hellboy, Milla Jovovich plays Nimue, an ancient and powerful witch and the principal villain of the piece. Nimue, also known as the Blood Queen, was introduced in The Wild Hunt storyline in 2008 after being mentioned earlier, and Hellboy star David Harbour has noted that she has a "special relationship" to Hellboy himself. Let's examine why Nimue is so dangerous. Nimue was originally known as the Lady of the Lake, a being from Arthurian legend who was in life a powerful witch who was extremely close to Merlin. Merlin told her all of his magical secrets, but that wasn't enough, and she ultimately imprisoned him and went mad with her own dark knowledge, which included worshipping the Ogdru Jahad. She was eventually killed when all the other witches of Britain banded together to kill her and seal her body deep in a tomb. In The Wild Hunt, Nimue is resurrected after she's nominated to become the leader of the witches of Britain, many of whom flee in terror from her power. It's during this storyline that Morgana le Fay reveals to Hellboy that he is actually, through her, the last heir of King Arthur (yes, Hellboy comics are wild), setting up a showdown between Hellboy and Nimue that could bring about the end of the world. Suffice it to say Nimue is bad news indeed. Hellboy's powers and overall look come from his heritage, but he wouldn't be who he is without Professor Trevor "Broom" Bruttenholm, the man who found and essentially adopted him in 1944 when he first appeared on Earth. Bruttenholm is an English occult expert who began working with Allied forces in World War II as it became clear that the Nazis were planning to use dark magic to call demonic forces to aid them and turn the tide. Grigori Rasputin, the Russian magician who was thought to be dead until he joined the Nazis, conducted the ritual that ultimately raised Hellboy, who fell into Broom's possession instead. Together, Broom and Hellboy joined the Bureau for Paranormal Research and Defense after the war, and battled various occult threats together until Broom's retirement as director of the agency. In the comics, Broom was killed in 1994 by a frog monster tied to the Ogdru Jahad. His death ignited years of battles against such creatures. For the five decades they knew each other, Broom played a major paternal role in Hellboy's life, and shaped both his knowledge of the occult and his love of the human world. On film, he was played by John Hurt in 2004's Hellboy and 2008's Hellboy II: The Golden Army, and is played by Ian McShane in the new movie. Throughout his comic book and cinematic history, Hellboy has retained close ties to the Bureau for Paranormal Research and Defense (B.P.R.D. ), an organization for which he serves as a field agent. The B.P.R.D. was founded near the end of World War II by Professor Bruttenholm after it was discovered that Nazi Germany was conducting a series of dangerous occult operations. After the war, the B.P.R.D. set up shop at an air base in New Mexico before eventually relocating to a private facility (which also serves as Hellboy's home) in the late 1940s. The bureau's mission is right there in its name. Its job is to research and combat various occult threats and phenomena that may pose a threat to humanity, often with the aid of various supernatural entities and humans who have been gifted with special abilities. Hellboy is the most prominent of these members, but the bureau has also included the fish man Abe Sapien, the pyrokinetic human Elizabeth Sherman (both seen in the original Hellboy film), and more. In the 2019 film, the B.P.R.D. 's superhuman contingent is represented by both Hellboy and Ben Daimio, a B.P.R.D. agent who was killed by a jaguar cult on assignment in Bolivia. Daimio rose from the dead, bearing horrific facial scars, and has since manifested the ability to transform into a jaguar creature. 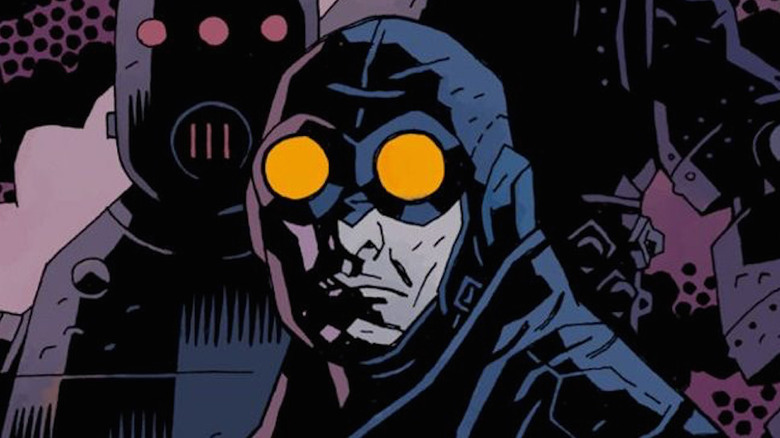 In November of 2018, a last-minute casting addition was announced for the new Hellboy film: Thomas Haden Church joined the reboot as Lobster Johnson, a character created by Mike Mignola in 1999 as an homage to various pulp heroes of the 1930s. In life he was known as "The Lobster," a vigilante in Depression-era New York City who was known for burning his lobster emblem into the flesh of criminals. To the public, he was thought to be an urban legend, and eventually a fictional character dreamed up by a pulp writer. The Lobster was, in fact, very real, and even began working for the U.S. government in the late 1930s in an effort to thwart various Nazi missions. He died in 1939 while attempting to stop a Nazi space launch that would have possibly put the Third Reich in contact with various supernatural entities among the cosmos. In 2001, he re-emerged as a ghost who encountered Hellboy (who was a fan of The Lobster stories) in the ruins of the castle where he died, and began helping Hellboy and other B.P.R.D. agents with their missions. In 2007 he started appearing in his own solo comic book adventures. Why is it a reboot? The first two Hellboy films were masterminded by director Guillermo del Toro, with Ron Perlman in the title role. 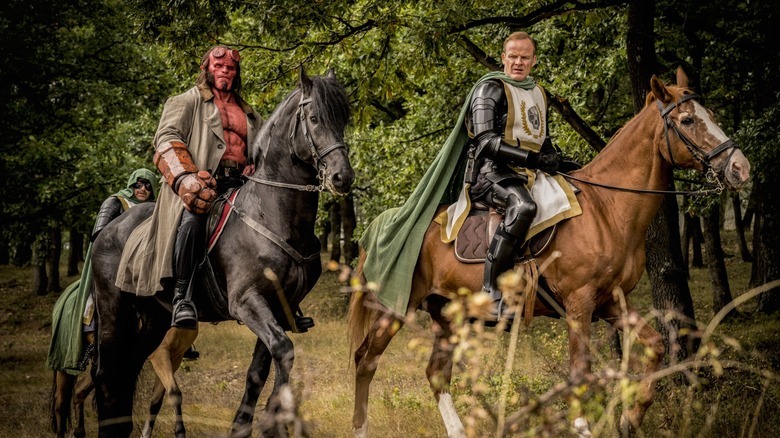 Hellboy II: The Golden Army ends on a cliffhanger, setting up a final battle with the fate of the world at stake which was supposed to arrive in a third film. Alas, The Golden Army underperformed, and the planned third movie didn't materialize. As years went by, del Toro continued to express a desire to make it, but in early 2017 he announced that all efforts had finally been exhausted. Months later, the reboot was announced without del Toro attached. 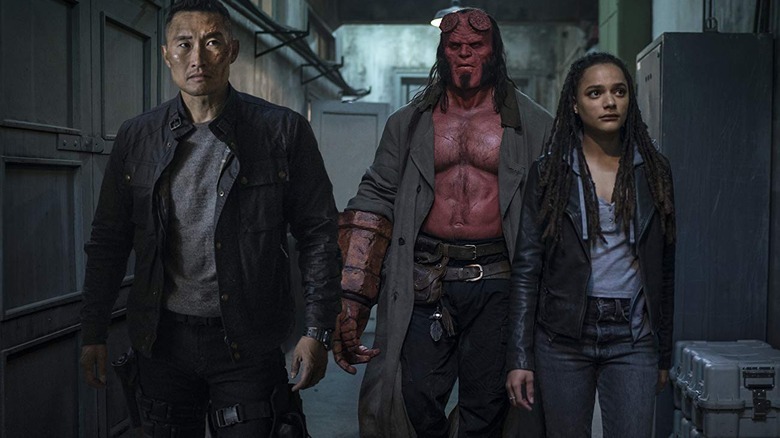 According to Hellboy creator Mike Mignola, there was some talk of trying to continue del Toro's story with a new film, but he felt that wouldn't be fair to a new team of filmmakers. "We went back and forth on that," Mignola explained. "Early on there was some idea of continuing the storyline that del Toro had started but would that be fair to a new director? So we decided to just start over. Neil [Marshall] is a horror director so the idea then was to a make a darker film. If you are going to use a guy, let him do what he does best." In the summer of 2017, the Hellboy reboot ignited an uproar when the actor who would play one of its most important characters was announced. Ed Skrein (Deadpool) was confirmed in August of that year to play Ben Daimio, which would mark the first live-action depiction of the character. In the comics, Daimio is Japanese-American, and this heritage plays a major role in his life and in B.P.R.D. comics stories. Fans were both confused and upset that the production didn't cast a Japanese-American actor to better depict the character onscreen. Skrein became aware of the outcry after taking the role (he was unaware of the character's heritage at the time), and released a statement saying he would be departing the production to make room for another actor. 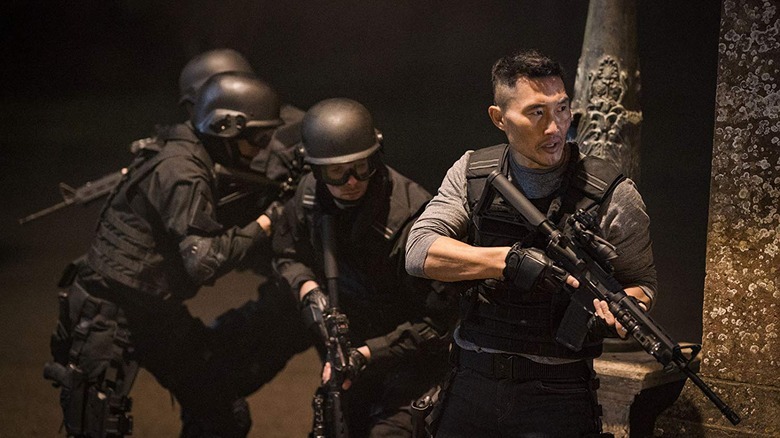 Then, in September 2017, Korean-American actor Daniel Dae Kim signed on to play the role of Ben Daimio. So the Hellboy reboot briefly ignited a whitewashing controversy, but thanks to Skrein's quick and honorable response and the production's willingness to correct itself, we got a Ben Daimio who looks more like the Ben we were introduced to on the comics page. And, as an added bonus, Kim and Skrein have become real-life friends because of the incident. Both of Hellboy's previous big-screen adventures, Hellboy in 2004 and Hellboy II: The Golden Army in 2008, where PG-13 rated fantasy adventures with certain horror elements, keeping them in line with most other comic book adaptations released in the 2000s to attract the biggest audience possible. Now, with the box office success of films like Logan and Deadpool, filmmakers are being given more freedom to make their comic book adaptations more adult-oriented. 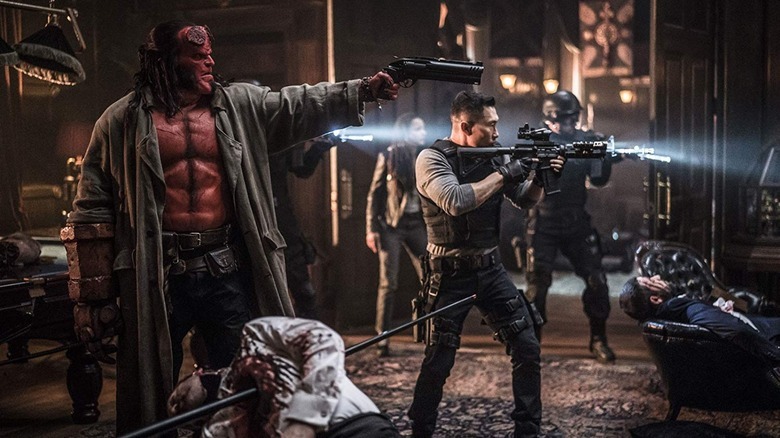 In 2017, Hellboy director Neil Marshall remarked that he had "been granted permission" to take the film into R-rated territory, which he saw not as a mandate, but as a license to depict the same level of violence often explored in the comics. "It's not like I'm going to force it to be R-rated," he said, "but if it happens to come out that way, just because of my own sensibilities, then fine. And nobody's going to stop us. So, that's the main [difference]. But, also, when you go back the original material, it is kind of bloody, so I'm going to embrace that." 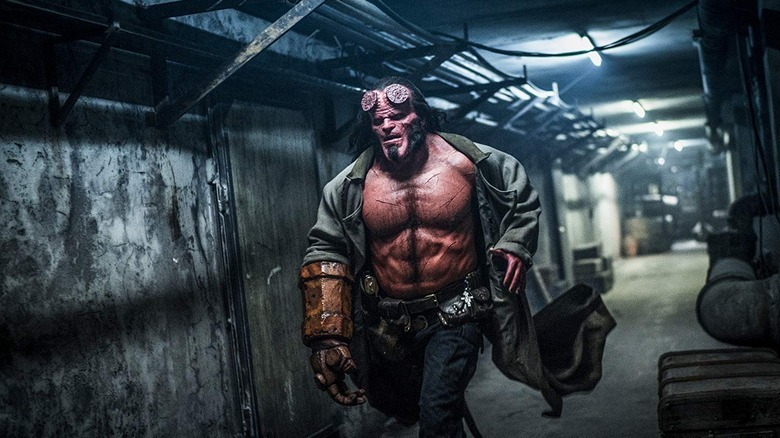 In February of 2019, the Hellboy reboot was officially rated R, for "strong bloody violence and gore throughout," by the Motion Picture Association of America. It also earned that rating because of language, so expect this Hellboy to drop a few F-bombs along the way. How much is Mike Mignola involved? Hellboy creator Mike Mignola bonded with director Guillermo del Toro over a shared love of folklore and monster movies, and they'd known each other for years by the time Hellboy was released in 2004. With that film and its sequel, Mignola worked on conceptual art to help translate his creation to the big screen, while del Toro had a bigger hand in shaping the story, particularly with the major turn taken in the second film. 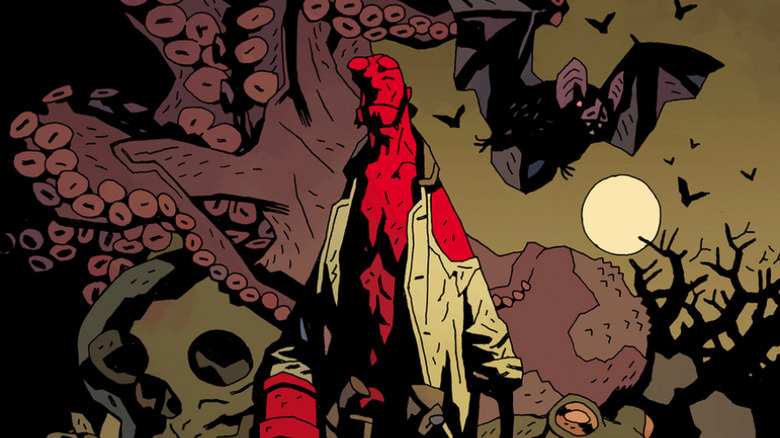 For the rebooted Hellboy, which will again be adapted from comics, Mignola took a step back from the visuals, but was a more active participant in the storytelling. 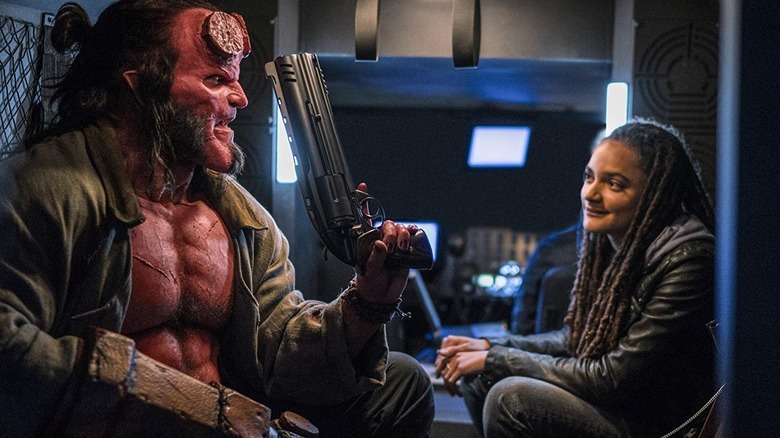 "It was very different, but I have been involved ever since they said 'Hey we're gonna make another Hellboy movie, and we're gonna do this story,'" Mignola said in 2018. "I've bounced back and forth with them about how to adapt this particular Hellboy story. At various times I've jumped in and been much more active in the screenplay than I ever was on the del Toro movies. But I did nothing so far as design stuff on the movie." How much will it rely on the comics? The first Hellboy film was a loose adaptation of his first major story, Seed of Destruction. The sequel, The Golden Army, was an original story conceived by Guillermo del Toro, and the third film would have followed that concept. 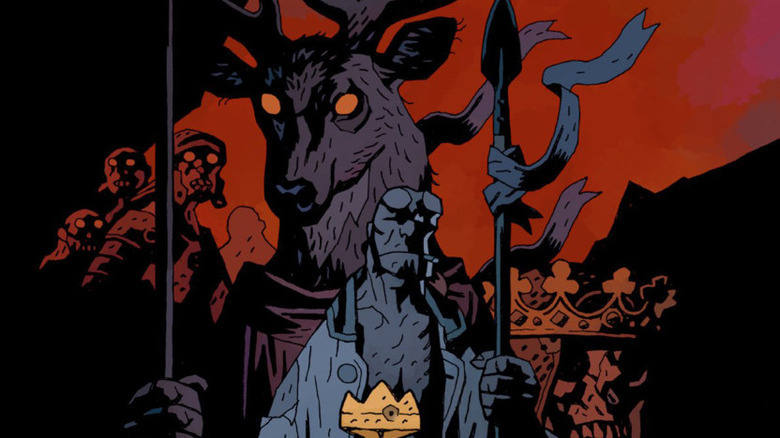 For the reboot, creator Mike Mignola and company didn't necessarily want to retell the character's origin story, but they did want to draw heavily from the original comics, so much of Hellboy 2019 was drawn from the main comic book story to feature Nimue the Blood Queen, The Wild Hunt, with elements drawn from Darkness Calls and The Storm and the Fury as well as more recent efforts like Hellboy In Mexico. In terms of the look of the film, concept artists pulled direct inspiration from comics by Mignola and other artists, then adapted them to a more real-world look. "What we did is we referenced the comic art, we referenced Mike's illustrations and a number of the other artists that have done different versions of the same character in their styles," makeup artist Joel Harlow said. "We referenced the artwork, but what we wanted to do with the character was to make him feel grittier, to feel not so much like a comic character — what would this character look like if he was in the real world? Hence the addition of the scars and the addition of the hair and the overall sort of weathering on him that you do find in the illustrations." What convinced David Harbour to take the role? David Harbour became a star monster hunter in the eyes of genre fans thanks to his role as Chief Hopper in Stranger Things, a role that gave him the prominence necessary to get a blockbuster job like Hellboy. 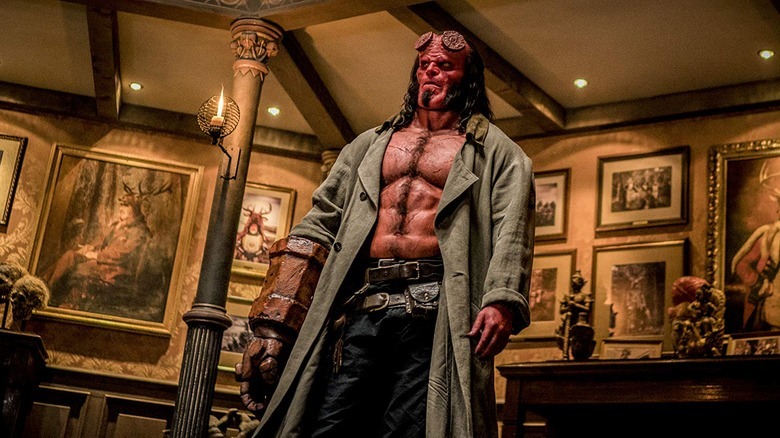 Playing Hellboy created a different set of challenges for Harbour, though, and not just because of the prosthetic applications and all the stunt work. Playing Hellboy also meant stepping into a role already made famous by Ron Perlman across two different movies. So how did Harbour decide to take the job? By finding a new approach to the source material. "Even when they approached me I was like, why do it? It's already been done. And they said they wanted to do it differently," Harbour explained. "And there is something when you go back to the actual graphic novel that is a bit darker and bit less clean. And even in terms of the character arc of Hellboy himself, this piece focuses a little more on his internal struggles. I equate it to Hamlet, a little bit, it's got a certain Hamlet feel to it. 'I am the beast of the apocalypse! Should I become the beast of the apocalypse? To be or not to be the beast of the apocalypse' is kind of the question."